Everyone applauded when Amazon reaffirmed a policy of not allowing junk and worthless public domain ebooks in the Kindle Store earlier this year. It promised to cut back on the worthless search results we have to wade through to find the ebooks we want. Unfortunately, Amazon clearly hasn't applied the same policy to audiobooks. I've learned today that at least one audiobook producer has been feeding public domain titles through a speech synthesizer and selling the output as audiobooks. The company is called Eternal Classic Audiobooks, and you can find their products in Amazon, iTunes, CDbaby, and elsewhere. The selection on Amazon consists of 63 titles, including Metamorphosis, Sherlock Holmes, Robinson Crusoe, and more. All the ones I can see are public domain titles, and the several I sampled all used the same computer generated female voice reading the bare text without any added pauses, explanations, intonation, or even the title being read to you. Do you have TTS on your ereader? It sounded like that, only not as good as on the latest Kindle. And since Amazon offers samples, you can check for yourself without having to buy the audiobook. 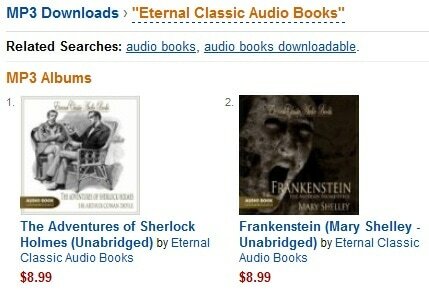 One word of advice when searching for more audiobooks: avoid the Eternal Classic Audio Books series. While unabridged, they’re read by a computer-generated voice and sound absolutely awful! I'm at a loss to figure out why Amazon hasn't removed this content. it's the next best thing to spam ebooks, and yet they've been allowed to sell the audiobooks since 2010 (if Amazon's info is to be beleived). I'm also at a loss why anyone would want to get these audiobooks. If I wanted a public domain audiobook I'd either get one because of I liked the voice actor narrating it or I'd go get a free one from LibriVox. That site has an extensive collection of user generated audiobooks available as a free downloads. I'm sure the quality is hit or miss, but it cannot possibly be much worse than the crap produced by Eternal Classic Audiobooks.